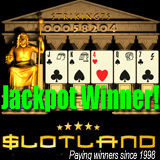 Gamblogger: Another Big Video Poker Jackpot Winner at Slotland Already! Another Big Video Poker Jackpot Winner at Slotland Already! It's been barely a month since a $145K jackpot win at Slotland.com but its progressive jackpot has already been hit again! Marianne M., a toy company project manager known as WYNDSTAR on the site, won $83,979 playing the Striking 7s video poker game last Friday. Marianne M. has been playing at Slotland since March 2009. She said she keeps coming back to Slotland because she enjoys its one-of-a-kind games and finds that the wagering requirements on promotional bonuses are fair. Striking 7s is a video poker game where 7s are Wild and a special bonus round can multiply winnings. Players receive five cards and can hold all five or receive up to five new cards to create the best poker hand possible. After every winning hand, players can take their winnings or take a chance at doubling them by drawing a card of higher value than the first card drawn. All slots games at Slotland.com are tied to one big progressive jackpot. In Striking 7s, it takes a Natural Royal Flush with a $10 bet to win the jackpot. Launched just last month, the new Jewels of the Ancients slot machine is the twentieth unique game at Slotland which has been offering one-of-a-kind slot machines and video poker games for more than twelve years. The jackpot winner said she plans to save most of her win. She’ll invest part of it but also plans to take her boyfriend on a vacation to South America. This is Slotland’s third big jackpot winner this year. In January a new player won $104K playing the Booster slot machine followed by the $145K win on Lucky Ducts at the end of February. Last year there were six major jackpot wins ranging from $78K to $165K. The progressive jackpot at Slotland was reset to $50,000 after this win. Meanwhile at Slotland’s sister casino, WinADayCasino.com, the jackpot was also won just recently and but is back up to over $75,000.